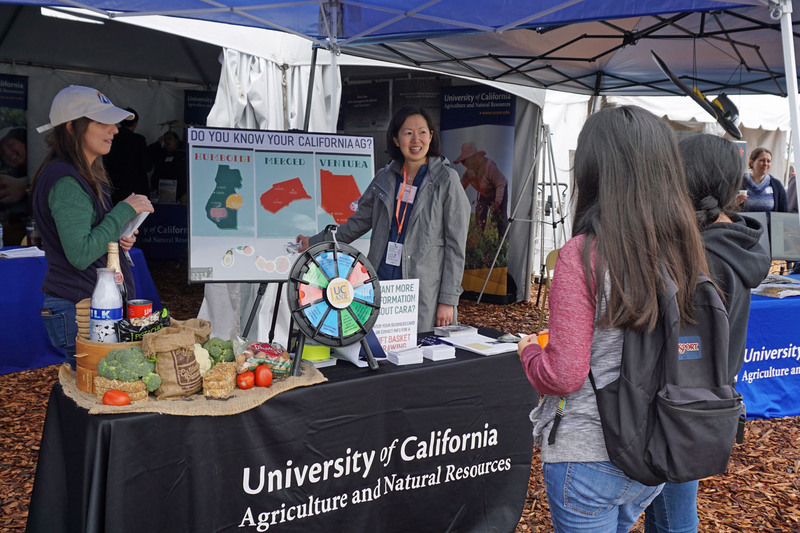 “Do you want to test your knowledge of California agriculture?” we asked visitors at the World Ag Expo last week. Young and old, students and seniors, teachers and parents, journalists and farmers, the confident and the hesitant, drew near and took part in our quiz game. Their task? To match three pictured items to the appropriate California county: Humboldt, in the North; Merced, in the Central Valley; and Ventura, in southern CA. As some participants guessed lemons in Humboldt, avocados in Merced, and timber in Ventura, we prompted them to consider regional geography and climate. When we revealed the answers, visitors learned about the Klamath beetle, introduced by UC Cooperative Extension advisors and entomologists in Humboldt in the 1940s to combat a weed that had taken over 150,000 acres of rangeland and posed a danger to grazing livestock. The solution employed by UC scientists was the first, and highly successful, case of using a biological control against an invasive species in the state. They also learned that Humboldt County is the leading producer of timber in California, and has historically been an important producer of livestock and dairy products. Participants learned about the significance of sweet potato production in Merced County, as well as figs, and tomatoes, introduced by Italian immigrants. They learned that Ventura is the leading producer of lemons in the state, and of the value of avocados and nursery plants produced there. Given that many were not aware of the range and scale of agriculture across California, we directed them to CARA, to explore the history and research involved in the development of agriculture in the state. We were delighted we had the opportunity to be part of the UC Agriculture and Natural Resources presence at the Expo, and to help promote the work of UC Cooperative Extension, which has had such historic impact on the state. One school teacher from the Central Valley was so taken by our game that she wanted to share it with her students. As CARA develops, we want to continue and expand this kind of community engagement, so people can know and appreciate what grows here.